There are evidences to show that the history of human settlement in Rajasthan dates back to 5,000 years. Due to its strategic location and with ancient rivers flowing through it, the region was conquered by various emperors which led to civilisational accretions. A confluence of cultures, traditions and social practices led to a creation of a syncretic lifestyle reflecting a secular eco-system of Rajasthan. From the times of Mughal kings, the region came to be called Rajputana. From Indus Valley to Gupta dynasty. It has come to light that parts of Rajasthan may have been occupied by the Indus Valley Civilisation (Harappans). 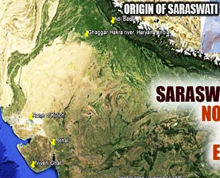 The excavations at Kalibanga in northern Rajasthan in 1998 revealed the existence of human settlements during Harappan times on the banks of Saraswati River that dried up later. It was a part of the Mauryan Empire (321-184 BCE). Over the centuries, Rajputana or its part have come under the control of various dynasties like Arjunyas, Hunas, Kushans, Malavas, Saka satraps and the Yaudheyas. The Gupta reign was also extended to this region in the 4th century. Some Buddhist caves and stupas have been found in Jhalawar in the southern part of Rajasthan. The decline of the 300-year-old Gupta Empire in the 6th century led to the political unrest in northern India. It was followed by political instability as numerous chieftains tried to gain power. The situation was stabilised when the Gurjara-Pratiharas emerged around 700 CE. Gurjar pratihars were well known for their hostility towards Arab invaders. These rulers maintained a huge army with cavalry regiment and were vigilant to fend off any possible invasion by Muslim rulers from either Persia or central Asia. Rajput king Prithviraj Chauhan (1149–1192 CE) defeated the invading Muhammad Ghori in the First Battle of Tarain in 1191. The powerful emperor gave a sound thrashing to Sultan Ghori's army for 16 times before getting betrayed by one of his own men. Chauhan was defeated by the invaders led by Ghori on the 17th occasion. After the defeat of Chauhan around 1200, a part of Rajasthan came under Muslim rulers for the first time. The principal centres of Muslim rule were Nagaur and Ajmer. Ranthambhor was also under their suzerainty. At the beginning of the 13th century, the most powerful state of Rajasthan was Mewar. The Rajputs resisted the Muslim incursions into India with valour and determination. But some of Rajput kingdoms eventually became subservient to the Delhi Sultanate. Mewar led others in fight against the Muslim rule. Mewar's ruler Rana Sanga fought the Battle of Khanua against Babur, the founder of the Mughal Empire. Between 1540-1556 CE, Afghans were in control of most of North India. Rajasthan-born Hemu held various official positions in the capital Delhi with Islam Shah and Adil Shah, who ruled from Punjab to Bengal. King Hemu who became the confidante of Afghan sultanate crushed the first rebellion in 1553 at Ajmer. In that battle, he killed the Afghan Governor Junaid Khan and appointed his own man as governor. Hemu won 22 battles against Afghan rebels and the Mughal king Akbar, losing none. He defeated Akbar's army in Agra and Delhi in 1556, and became King Vikramaditya after 350 years of foreign rule at Purana Quila in Delhi. 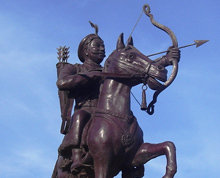 But Hemu was finally defeated at the Second Battle of Panipat on 7 November 1556 and was killed. Akbar arranged matrimonial alliances to gain the trust of Rajput rulers. He himself married the Rajput princess Jodha Bai, the daughter of the Maharaja of Amer. He granted high offices and privileges to a large number of Rajput princes to maintain cordial relations with them. Before long, these actions of Mughal king Akbar caused many previously hostile Rajputs to be his friends, and they even surrendered their kingdoms to him. Rulers like Raja Maan Singh of Amer were trusted allies. However, some Rajput rulers were not ready to accept Akbar’s dominance and preferred to remain independent. 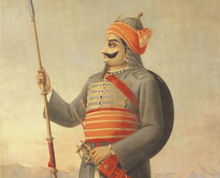 One such ruler was Raja Uday Singh of Mewar, who founded the city of Udaipur. He never accepted Akbar's supremacy and was at constant war with him. With no other option, Akbar forcefully seized Chittor, the capital of Mewar. After his death, the struggle against the struggle was continued by Uday Singh's son – Rana Pratap. He fought a valiant battle with Akbar at the Haldighat pass where Rana Pratap was defeated and wounded. Since then Pratap remained in recluse for 12 years and attacked the Mughal ruler from time to time. He fought bravely throughout his life and never ceded his independence to the Mughal ruler. When Rajput rulers lost their lands to invaders during the medieval period, their womenfolk would commit suicide by self-immolation on a pyre. This was a gesture to protect their chastity and self-respect and it was known as "Jauhar". Rajasthan's formerly independent kingdoms created a rich architectural and cultural heritage. Even today, the grand legacy of Rajasthan can be seen in their numerous forts and palaces (Mahals and Havelis) which are enriched by features of Muslim and Jain architecture. From the early 1700s, the Maratha Empire started to expand northwards led by PeshwaBaji Rao I of Pune. Over the years, the Mughals began to have internal disputes which greatly distracted them at times. The Mughal Empire continued to weaken, and with the decline of the Mughal Empire in the 18th century, Rajputana came under suzerainty of the Marathas. The Marathas, who were Hindus from the state of Maharashtra, ruled Rajputana for most of the 18th century. The expansion finally brought the newly founded Hindu Maratha Empire in contact with the Rajputs. Rajasthan saw many invasions by the Marathas under the military leadership of Holkars and Scindhias. Most of the Rajputana region passed under the control of the Maratha Empire. The kingdoms and chieftainships paid huge money to Pune till the British East India Company replaced the Marathas as the supreme authority. The Maratha Empire, which had replaced the Mughal Empire as the overlord of the subcontinent, was finally replaced by the British Empire in 1818. Following their rapid defeat, the Rajput kings concluded treaties with the British in the early 19th century. The various kingdoms of Rajputana accepted the British suzerainty and control over their external affairs in return for internal autonomy. The development of frescos in Rajasthan is linked with the history of the Marwaris, who played a crucial role in the economic development of the region. Many wealthy families throughout Indian history have links to Marwar. These include the legendary Birla, Bajaj and Mittal families. The arrival of the East India Company led to the integration of diverse regions of Rajputana for the first time under the compulsions of administrative efficacy. Of these various princely states, Marwar and Jaipur were the most significant in the early 19th-century. But it was Mewar that gained particular traction from James Tod, a British employee and a reputed chronicler of Rajasthan. A number of alliances were formed between the East India Company and the princely entities in the early 19th century. These royal fiefdoms accepted British sovereignty in return for local autonomy and protection from the Marathas. Following the Mughal tradition and more importantly due to its strategic location Ajmer became a province of British India. The autonomous Rajput states (ruled by small kings), the Muslim state (Tonk), and the Jat states (Bharatpur and Dholpur) were clubbed together to form Rajputana Agency. In 1817-18, the British government concluded treaties of alliance with almost all the states of Rajputana. The integration of various princely states of Rajasthan into a single entity as Rajputana Agency during the British rule was a major milestone. The province was further renamed as Rajasthan in 1949 after restructuring its geography a little bit. The name 'Rajasthan' was popularised by James Tod and some people believed that he had coined it. While James claimed that it was the classical name for the region, the term 'Rajasthan' seems first to be documented in an inscription dating from 1708 and to have become popular by his time. In March 1948 the Matsya Union consisting of Alwar, Bharatpur, Dhaulpur and Karauli was formed. Also in March 1948 Banswara, Bundi, Dungarpur, Jhalawar, Kishangarh, Kota, Pratapgarh, Shahpura and Tonk joined the Indian union and formed a part of Rajasthan. In April 1948 Udaipur joined the state of Rajasthan and the Maharana of Udaipur was made Rajpramukh. Therefore in 1948 the merger of south and south-eastern states was almost complete. Still retaining their independence from India were Jaipur and the desert kingdoms of Bikaner, Jodhpur and Jaisalmer. From a security point of view, it was vital for the new Indian Union to ensure that the desert kingdoms were integrated into the new nation. The princes finally agreed to sign the Instrument of Accession, and the kingdoms of Bikaner, Jodhpur, Jaisalmer and Jaipur were merged in March 1949. This time the Maharaja of Jaipur, Man Singh II was made the Rajpramukh of the state and Jaipur became its capital. Later in 1949, the United States of Matsya comprising the former kingdoms of Bharatpur, Alwar, Karauli and Dholpur, was incorporated into Rajasthan. On January 26, 1950, the princely state of Sirohi merged with 18 regions of unitedRajasthan. However, Abu Road and Dilwara of Sirohi remained a part of Greater Bombay which is now Gujarat. 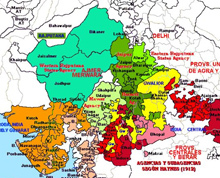 In November 1956, under the States Re-organisation Act, the erstwhile Ajmer state, Abu Road taluk of former Sirohi princely state (merged withGreater Bombay) and Sunel Tappa region of the former Madhya Bharat merged with Rajasthan. The Sirohi sub-district of Jhalawar was transferred to Madhya Pradesh. With further reorganisation of the states of Uttar Pradesh, Madhya Pradesh and Bihar in early 2000s, Rajasthan has become the largest state of the Indian Republic. The princes of the former kingdoms were granted hefty remuneration in the form of privy purses and privileges. In 1970, the then PM Indira Gandhi too steps to discontinue the privy purses which were abolished in 1971. Many of the former princes still continue to use the title of maharaja, but the title has little power other than status symbol. Some of the maharajas still hold their palaces and have converted them into profitable hotels, while some have made good in politics. A democratically elected government runs the state with a chief minister as its executive head and the governor as the head of the state. At present, including the new district of Pratapgarh, there are 33 districts, 105 sub-divisions, 37,889 villages, 241 tehsils and 222 towns in Rajasthan. 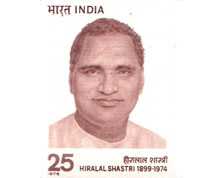 Hiralal Shastri was the first nominated CM of the state, taking office on 7 April 1949. He was succeeded by two other nominated holders of the office before Tika Ram Paliwal became the first elected chief minister from 3 March 1951.